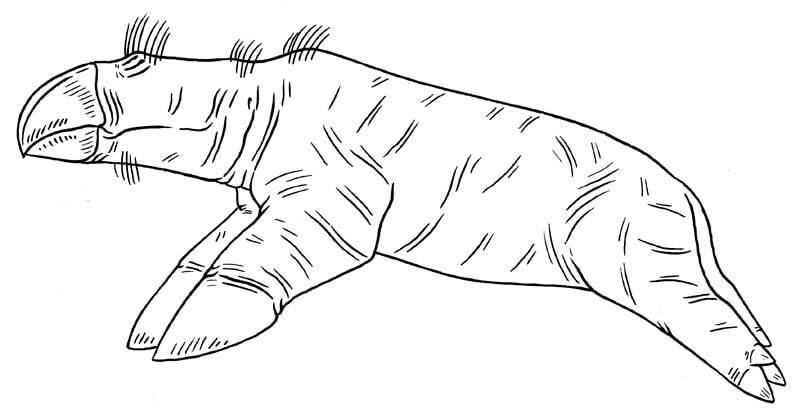 Thirdly we have the Beaked Whelpuggle (Myopotherium subterraneus), this rather odd and wretched creature was the last of the Mammalia, descended from the House Mouse (Mus musculus). Blind and nearly without any eyes at all, it is a subterranean digging animal which seizes insect larva with its large, beak-like incisors. Unusually, this animal proved more adaptable in its new home than expected. Giving rise to the Enantimammalia (Unmammals), which have expanded into many niches. Many of the initial forms were still without any useful eyes, and these evolved into animals which could echolocate either in air or underwater, resulting in eyeless bat-like creatures and even creatures resembling cetaceans. Eventually, atavisms laid the groundwork for eyes to re-appear and become useful, producing animals which had obvious eyes which, though still weak by our standards, worked quite well. All unmammals have fore-jaws that are composed of modified incisors, forming a beak-like shape, and the rear part of the jaw often bears horny plates for chewing food. The reproductive rate in eyed enatimammalians is very high, and they form a distorted facsimile of their distant ancestors, the rodents. The most primitive forms of Enantimammalian still lack useful eyes, and have filled some rather interesting niches. Most of these forms echolocate in order to navigate their surroundings. The Cheeptank (Hoplosibilus armatus) is an armadillo-like omnivore that depends on smell to find its food, though it usually uses echolocation in order to find its way around. They have heavily armoured backs, because lacking eyes can make you a target for would-be predators. Cheeptanks are found mainly in the tropics, and grow to the size of a small dog. During the mating season, males make various cheeping and twittering sounds to attract a mate. Pundbats (Myopovolantidae) are a family of echolocating, flighted unmammals that are usually active at night. Most forms are predators, such as this Ghoulish Pundbat (Gnathovolans rapax), which feeds on small prey snatched from the branches of trees. These animals range from the size of a thrush to some forms that can have a wingspan of 2 meters, due to the lack of flighted insects; there are no pundbats of exceedingly small size. Blind Breachers (genus Rhynchodelphis) are large marine forms which rely on echolocation in order to hunt and communicate. Technique is much like that of a dolphin, sound is emitted, and echoes are received by a large melon-like organ. These animals usually travel in small groups, and use sound to communicate. Their diet consists mainly of fishpoles of various sizes. Most members of this genus reach 3 to 4 meters long. One unsettling eyeless form is the Sodshark (Geoselache rex), a leathery-skinned tropical burrower as long as a man’s arm. Buried beneath the soil and leaf-litter, it will sit just below the surface, listening keenly for small animals moving above. It then surges out of the earth, snatching and killing the animal unawares, in its large powerful jaws. They are able to echolocate if it finds itself stranded above ground. The inner pulp of large tree-like herbs is a rich food-source for those who can obtain it. Clickgrubs (genus Lactovermis) are blind unmammals which live their entire lives chewing and gnawing through the innards of large plants, constantly feeding on the woody, sappy pulp. Most species are about the length of a man’s middle finger, though somewhat fatter. Enantimammalians that have eyes compose a subgroup which shares a single common ancestor, so apparently this trait has only evolved once. The eyes themselves are weak by the standards of other animals, but provide enough forewarning and information to negotiate the surroundings and predators (usually). Parrotcavies (genus Rhynchomys) are a common sight in the tropics, with species ranging from 20 to 50 centimetres long. They feed mainly on large seeds and nuts found on the ground, the large beak-like jaws usually make short work husking these. Hearing is acute, and the slightest sound of danger is enough to send them running for cover. In their natural habitat, they are almost ubiquitous due to their prodigiously fast rate of breeding. When communicating with others of their own species, they clack their teeth together loudly. Russet Treehammers (Picithera vocifer) are climbing forms common in temperate areas. They feed almost entirely upon creatures that are burrowing inside the pulp of trees and tree-like plants; this includes certain worms, arthropods, and clickgrubs. Treehammers have large ears and keen hearing in order to locate their food inside the tree trunks, they drum and peck open holes in the trees much like woodpeckers once did. The jaws, skull and braincase all have adaptations to bear the strain of hammering so powerfully. As well as drumming trees, they produce a sibilant wail in order to communicate with others of their own kind, as they usually travel in family groups. 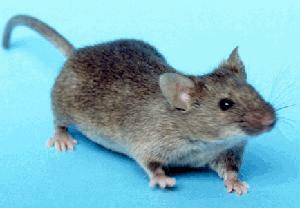 Huskmice (genus Psittacomus) are genus of small creatures, usually no larger than a house mouse or small rat. They feed on plant seeds, and are most often found in open country where seed-bearing herbs are abundant. Their beak-like teeth are somewhat kinetic and under muscular control, like the bill of a bird, and they use this to adeptly husk the seeds before eating them. As with many other members of this group, they breed quickly and in large numbers, occasionally plagues occur which is usually a boon for predators. Nippers (genus Mandibulosorex) are “insectivorous” forms which are most often the size of a mouse. They feed mainly on terrestrial invertebrates such as arthropods and worms, though small Paramphibians are sometimes taken. These animals usually live in family groups that share a burrow by night, and disperse to feed during the day. They will actively defend their feeding grounds against other nipper groups, which usually results in a lot of high-pitched squealing and biting, fatalities do occur. The group all breeds at once, most of the many babies are sired by the largest male. The Striped Padger (Omnivororhynchus pugnax) is a successful, 7 kilogram omnivore that is found in the temperate and tropical zones. It feeds on many kinds of small animal, carrion, seeds, and soft plant matter such as buds and new stems. Usually solitary, they are most often aggressive towards intruders, and will stand their ground even against predators. Its rate of reproduction is relatively sedate compared to other eyed unmammals.